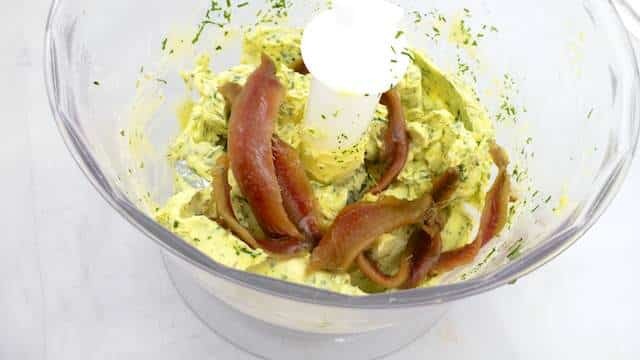 Creamy Anchovy Butter Recipe | Simple. Tasty. Good. I like this anchovy butter recipe a lot. And I make it quite often as well. It’s a great topping for red meat or you can also use it as a flavorful rub for beef or lamb skewers (especially if you’re throwing a summer bbq lunch or dinner party). It is amazing just how well the anchovy works in combination with a perfectly cooked thick steak! I have always loved the combination of a perfectly cooked medium rare steak and salted anchovy. Those flavors are the perfect match for each other if you ask me. 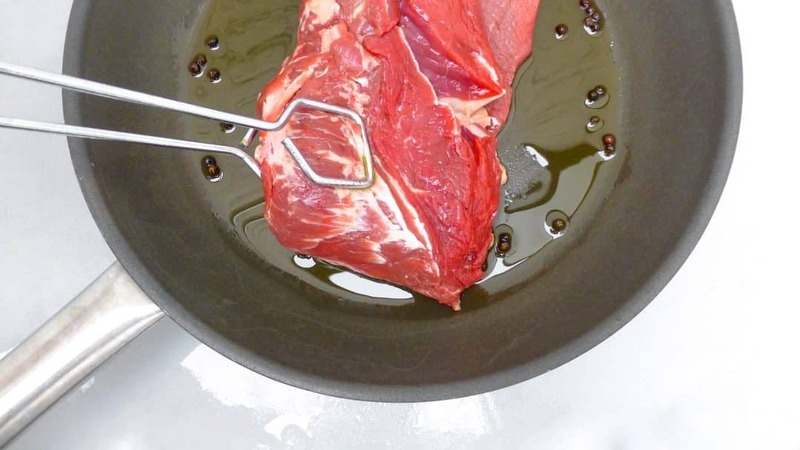 Before I used to add some salted anchovy fillets to the steak juices in the hot pan to melt and drizzle it as a kind of sauce on top of the cooked steaks right before serving. It also looks great when you just add a dollop of the smooth butter or a slice of the chilled compound butter to your food. 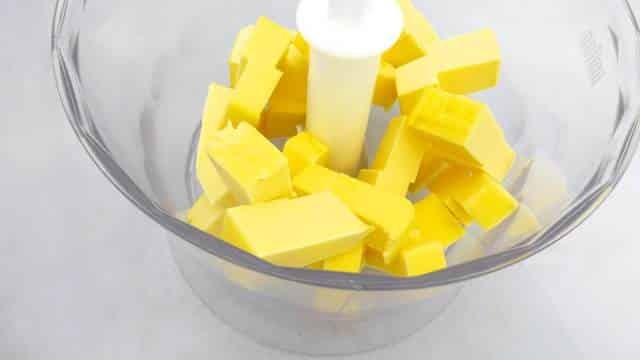 See how the butter slowly melts! That always looks very appetizing. 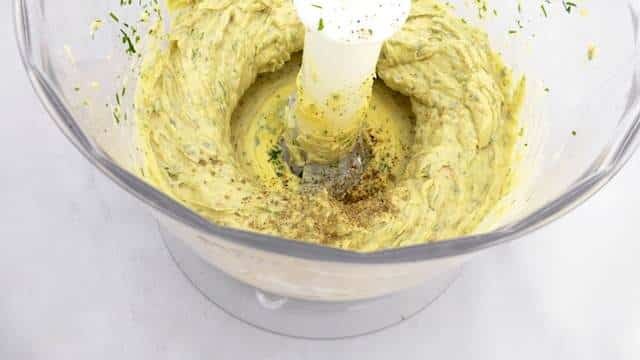 Anchovy butter is pretty easy to prepare and you need just very little ingredients to make it. Main elements are anchovies, butter and garlic. And fresh herbs, I went for fresh tarragon here. The tarragon gives this anchovy butter a pleasant flavor touch but you can also ad other herbs such as parsley or the classic chives. Or how about some dried herbs like thyme and oregano. Make sure the unsalted butter is very soft. Keep it at room temperature and hour before you plan to make the anchovy butter. If you have a little bit of this anchovy butter left, you can spread it on a piece of bread and toast it quickly under a hot grill as a snack. Or let it melt on a baked potato… I also served this anchovy butter with baked salmon, that’s also a combination you truly have to try out! And one of my favorite summer dishes: freshly steamed green asparagus with anchovy butter. Awesome. You can also do the same with steamed artichokes by the way. Or just toss some anchovy butter with freshly cooked al dente penne pasta… Wow, we already have a bunch of recipe ideas for our anchovy butter here! If you want to make neat round slices, you can let the butter chill for just a couple of minutes and then wrap it up in a piece of cling film creating a kind of sausage shape. Then let the butter chill and set in the fridge for at least 1 hour. Just slice the chilled anchovy butter up right before serving. Or you can scoop the freshly homemade anchovy butter in a ramekin and serve it smooth and soft at room temperature. 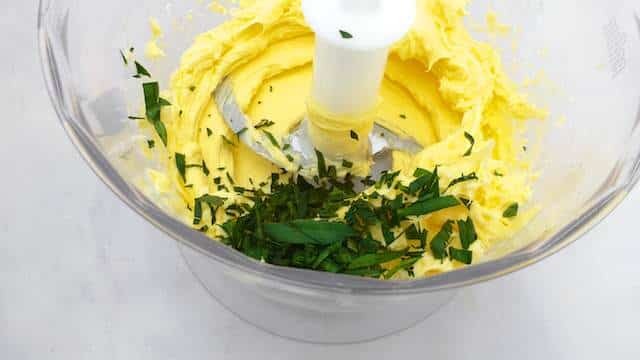 Love compound butter? Then also check out my truffle butter recipe! 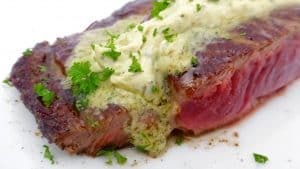 Homemade creamy anchovy butter recipe: great to put on top of a sizzling cooked steak! Make sure the butter is very soft, at room temperature. Add it to a blender. Blend it well until creamy and smooth. Then add the chopped tarragon and garlic paste. Blend again. Check the seasoning and add extra pepper or garlic paste to taste. Pour the olive oil in a large non-stick pan, season with a little pepper and place it over high heat. Once the oil is smoking hot, add the steaks. Sear them nicely on both sides until dark brown. 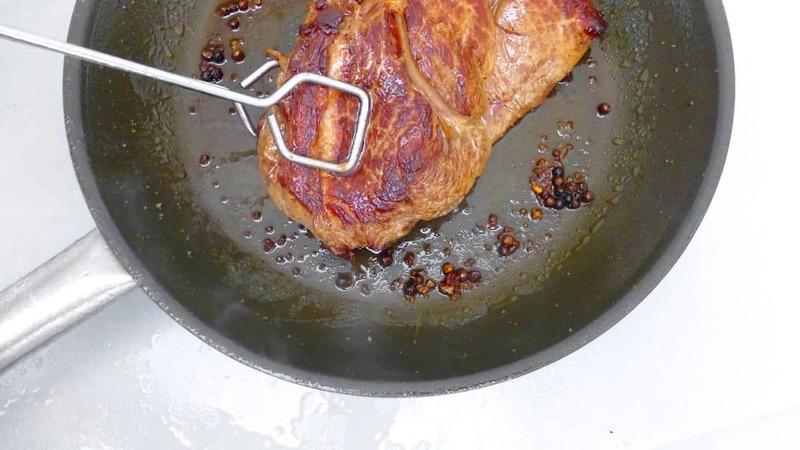 Cook the steaks the way you prefer. I like my steaks rare to medium rare. Once cooked, remove the steaks from the pan and let them rest on a clean chopping board covered with tinfoil for 5 minutes. Then place them onto warm plates and finish with a generous dollop or a slice of anchovy butter. Serve immediately.